An overview of my talk about self-publishing, given on behalf of the Alliance of Independent Authors, at last week’s Cambridge Literary Festival. 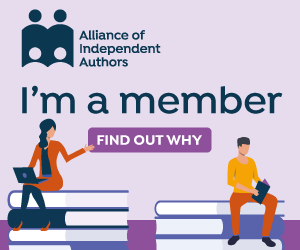 Last Sunday I had the honour of representing the Alliance of Independent Authors (ALLi) as a speaker at the Cambridge Literature Festival, the new name for the Cambridge WordFest. It was the first time I’d taken the stage at a major literary festival, my presence last autumn at the Cheltenham Literature Festival being over the airwaves from the Green Room via BBC Radio Gloucestershire, rather than before a studio audience. It was heartening to have this opportunity to spread the word about the virtues and benefits of self-publishing at a major literary festival in one of the nation’s foremost university cities. 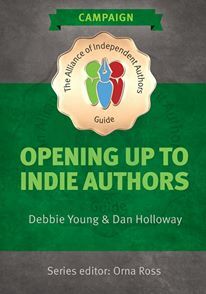 It was also timely, as two days later I was due to launch at the London Book Fair a new book I’d co-authored with Dan Holloway, Opening Up To Indie Authors, which includes guidance on how self-published authors may work more effectively with literary festival organisers. I applaud the organisers of the Cambridge Literary Festival for their inclusive thinking, and I very much hope that this will be the first of many such events far and wide. Waiting in the Cambridge Festival Green Room, it was exciting to see prominent members of the modern publishing scene dip in and out between talks. I shared a coffee table with Dame Jacqueline Wilson, former Children’s Laureate, and remarked to the Astronomer Royal, Sir Martin Rees, that I would that evening be having tea with my cousin Dr Frances Willmoth, the author of an important book about the first Astronomer Royal. That made me feel more intelligent by association, at least! Strange too, though, to realise what a small world publishing is. The first person I bumped into was a publicist who I knew from my time working for the children’s reading charity Read for Good. I also sat opposite children’s author Jamila Gavin, who lives and works a few miles up the road from my home on the other side of the country. I was to do a double-act with editorial consultant Rebecca Swift, founder of The Literary Consultancy. Together we were to describe the current state of the publishing industry, including both traditional publishing routes and the newer self-publishing model. Rebecca appeared to know everybody in the Green Room, kindly introducing me to many of her friends, including Melissa Benn, daughter of the late, legendary Tony Benn MP. Melissa had just interviewed another notable politician, Alan Johnson MP, on stage. Melissa decided to join the audience of our talk, as Rebecca had been at hers. It’s a perk of being a speaker that you’re allowed to attend a number of other talks while you’re there, free of charge. We headed off to the place designated for our talk, led by one of the many amiable and efficient stewards. 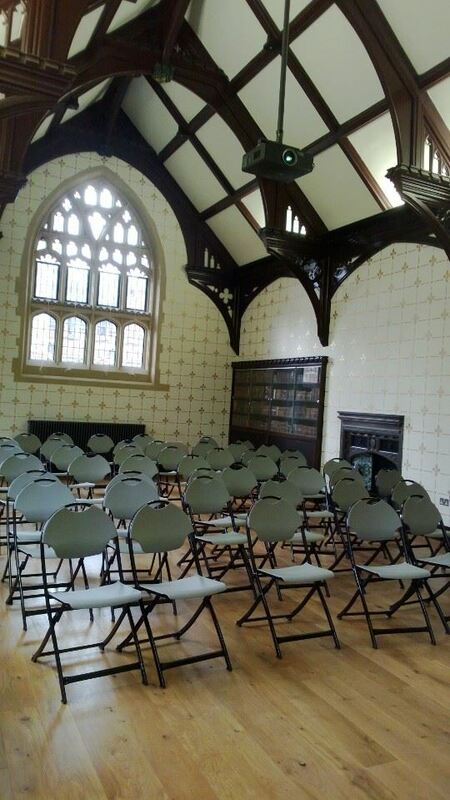 Our venue: a historic and inspiring room with the wonderful name of Divinity Lightfoot. I thought this would make a great name for a character in a detective novel or a Bond Movie, but it turned out to be an elegant, airy room flooded with natural light in the Divinity School of St John’s College, Cambridge. The golden fleur-de-lys that dappled the walls were all hand-painted, the steward assured me. We kicked off with a straw poll of our standing-room-only audience to help us pitch our talk. We asked who was trade published, who had self-published, and who was happy with their lot. About half a dozen hands went up for each of the first two questions, and none for the third. It was going to be interesting. Becky kicked off the presentation, drawing on her background as an editor with Virago to create a vivid picture of how publishers and agents handle submissions. She knew how hard it was for a new author’s work to progress beyond the slush pile, and this led to her setting up her company, The Literary Consultancy, offering editorial advice to authors before they launch their manuscripts to publishers and agents. When Becky founded TLC, self-publishing in its modern form was not an option, but as more aspiring authors learn of its potential, more are considering that route. I explained what modern self-publishing means and outlined the many opportunities it offers for commercial and critical success. I also dispelled myths and outmoded ideas about self-publishing, and I spelled out the difference between professional self-publishing, where the author assumes the role and responsibliities of the publisher, and the old-fashioned “vanity press”, in which a printing company converts a manuscript without criticism, guidance or quality control, into a printed book. Though one might have expected Becky and I to diverge, as so many of her clients have found success via traditional trade publishing deals, we actually concurred in many ways. I addressed head on the elephant in the room that some self-publishing advocates ignore: the importance of quality control. Many bad self-published books abound because it’s so easy for authors to click the “publish” button without proper proofreading, editing or formatting – but I endorsed Becky’s call for authors to polish their manuscripts to the highest degree before launching them on the world. Her services would be as valuable to self-published authors as to those seeking the traditional route. The flurry of eager questions at the end of the session suggested that Becky and I had restored the faith and enthusiasm of the audience to persevere with their publishing projects, whichever route to publication they chose. The range of the audience members’ writing projects was fascinating and original, from an autobiography that required a soundtrack to the invention of new genres. Anyone for a crossover of a political satire with fantasy? Sounds good to me! Many guests stayed long after our talk was over to ask further questions and to pick up our business cards so that they could follow us up later. When I walked up and down the empty rows to gather any remaining TLC or ALLi leaflets that the stewards had kindly put on chairs, I was pleased to discover only two remained, demonstrating the audience’s serious interest in our services. Several of the stewards attended our talk, lingering after the paying guests had gone to talk about their own publishing ambitions. I suspect most of these stewards are volunteers, taking part simply for the love of books, so it was a real pleasure to be able to help them, after they’d spent days taking such good care of festival speakers and guests like us. I had only one regret: that I’d brought only one copy of my book promotion handbook, Sell Your Books!, for reference, instead of bringing more to sell. But I was delighted when Melissa Benn snapped up that copy. I also went away with a new book myself, a beautiful hardback of the novel Dory’s Avengers by Alison Jack, a Cambridge-based author and editor whom I’d previously befriended on Twitter. She’d kindly brought me her book as a gift. 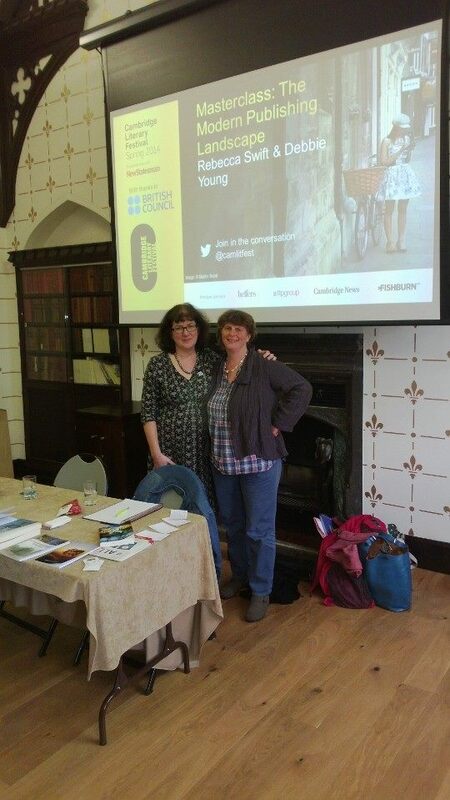 She also obligingly took the photo shown here of Becky and me after our talk. Two days later, our paths were to cross again at the London Book Fair – but I’ll return to that in another post. Sounds like it went just swimmingly! And what a gorgeous room for a talk, indeed. Out here, rooms like that are hard to come by at all, let alone for public use! I think in an ancient university city like Cambridge, such rooms are a dime a dozen, Laura. Still hugely appealing though! Thank you, Claire, I am sure you’ll find the book helpful – and if you can find a moment to post a review on Amazon or Goodreads, I’d be ever so grateful!